In many parts of the world, millions of children go to bed hungry. Yet in advanced countries, inconceivable amounts of edible food are thrown away. Worse still, the alarming rates of childhood obesity have driven powerful voices to act in recent times. Such irony shows that the world needs urgent, innovative solutions to strike a balance between feeding itself and maintaining a healthy lifestyle for its growing population. Let’s imagine it’s the year 2030 and I’ve got on my wrist a wearable device that matches my culinary preferences and calorie requirements per meal or a mobile app that allows me to ‘tableshare’ my meals within a registered community the same way commuters use Uber for mobility. Algorithms for gastronomy. Bytes for bites. Maybe tomorrow’s cutlery will be powered by computer programming: spoons that lock up after you’ve had your daily recommended intake of ice cream. 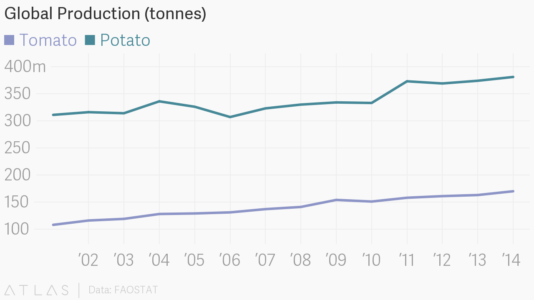 Global production of tomatoes and potatoes.